Posted by Lorea Thomson on Sunday, May 28th, 2017 at 1:31pm. Memorial Day is observed on the last Monday in May. 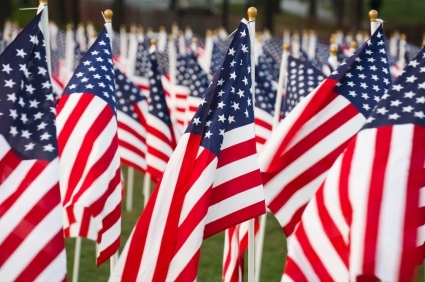 It was formerly known as “Decoration Day” and it commemorates all men and women who have died in military service for the United States of America. Many people visit cemeteries and memorials on Memorial Day and it is known as the informal start of the summer season! This Memorial Day weekend try something that involves beach, fun and sand.Peanut Island, the 80-acre tropical island located at the west end of the Palm Beach (Lake Worth) Inlet. It’s a get-there-by-only-boat county park, where long strings of boats raft up while hundreds of people socialize in the shallow off-shore water. If you don’t have your own boat, you can still get to Peanut Island. The Peanut Island Shuttle leaves from the Sailfish Marina on Singer Island, $12 per person round trip, call 561-844-1724 X4. Trips are every two hours beginning at 9:45 a.m.; last pick-up from Peanut Island is 5:30 p.m. The Peanut Island Water leaves from Riviera Beach Municipal Marina every 30 minutes. Email captjoe@peanutislandwatertaxi.com or call 561-844-7969 for a reservation. If the weather doesn’t agree with outdoor celebrating of our service men and women heroes, watch a televised patriotic concert. One of PBS’ highest-rated programs, the multi-award-winning television event has become an American tradition, featuring a star-studded lineup performing in tribute to all Americans who have sacrificed for our country. The concert’s mission is to unite the country in remembrance and appreciation of the fallen and to serve those who are grieving. Tune in Sunday, May 28, 2017, 8/7c., on the eve of Memorial Day, a star-studded lineup will grace the stage. For over 25 years, this multiple-award-winning television event has honored the military service and sacrifice of all our men and women in uniform, their families at home, and those who have made the ultimate sacrifice for our country.